An actuator is a mechanism that puts something into automatic action. It is a mechanism by which an agent acts upon an environment. The agent can be either an artificial intelligence agent or any other autonomous being. Some examples of actuators of these various agents are arms, hands, fingers and legs in human and g.htmling mechanism and moving parts in robot. Actuators are the final elements in a control system. They receive a low power command signal and energy input to amplify the command signal as appropriate to produce the required output. In mid sixties, automation and modern process control systems start to influence industry. Especially in process technology, the central controls of the operation processes become a dominating subject. In large industrial units often hundreds of valves are operated at the same time. Valve and machine actuators were ideas that turned into a product. Werner Reister and Rudolf Dinse start the development of the first range of actuators. They believed that actuators should be robust and reliable. Actuators were first used in water and sewage treatment plants. SA 8 - SA 18 is the first marketable series of actuators with the trademark AUMA. Despite small quantities in the beginning, the basis for further development was created. Electromagnetic Actuators - Exploit the mutual attraction of soft ferrous materials in a magnetic field. The device has one coil that provides the field energy and the energy to be transformed. The attractive force is unidirectional so a return device of some type is needed, often a spring. Relays or solenoids based on this principle are widely used in cars to switch a range of electrical equipment with a current demand of more than about 10amps-fans, headlights, horns, and wipers. Electrodynamic Actuators - Based on the force generated when a current carrying conductor is held in a magnetic field. DC motors are frequently used as part of an actuator system. Linear Actuator - Provide a linear motion via a motor driven ball screw or ACME screw assembly. The linear actuator's load is attached to the end of the screw, or rod, and is unsupported. The screw can be direct, belt, or gear driven. Pneumatic Actuators - Uses a pneumatic cylinder. They are used for opening and closing of grippers. Some of the actuators achieve limited rotary motion by using the linear actuator to turn a shaft with a rack and pinion gearing system, or with a chain. 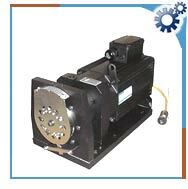 Hydraulic Actuator - Uses a hydraulic cylinder. Hydraulic fluid cannot be used for energy storage, so another power source must be used to create pressure in the oil. The flow of oil into the cylinder is controlled by a distributor-a set of tubes that rotate with the shaft. Rotary hydraulic servo-drives are often used in robotics. Electric Actuators - Two types of electric motors are in use - stepper motors and direct motors. Stepper motors are driven by a train of electrical pulses. Direct motors are most common in industrial robots. Piezoelectric Actuators - Piezoelectric is a property of a crystal to expand when electric voltage is applied to it and return to normal when the electric voltage is cut. These actuators exhibit characteristics like extreme rapid response, ultra-minute movements and amazing power. They are widely used in the precision opening and closing of valves in semiconductor manufacturing equipment. Geared actuator applications range from simple low power switches to high power hydraulic devices operating flaps and control surfaces on aircraft, valves, car steering, etc. Actuators are used for the automatic control of a variety of valves, as well as other applications requiring high torque precision rotation in a small footprint. Typical applications of actuators are laboratory automation, PC controlled valve actuation, small valve control in production environment, and OEM automated sampling and measuring devices. They are also used in industrial applications and commercial applications.